270 pages | 29 B/W Illus. Since the collapse of the Soviet Union, Russia has developed a powerful business community and a potent network of transnational organized groups. Russian Business Power explores the powerful impact these new actors are having on the evolution of the Russian state and its foreign behaviour. 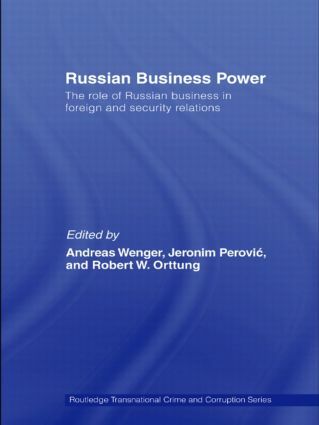 Unlike other books, which focus either on Russia's foreign and security policy, or on the evolution of Russian business, legal and illegal, within the context of Russia's domestic transition, this book considers how far Russia's foreign and security policy is shaped by business. It considers a wide range of issues, including energy, the arms trade, international drug flows, and human trafficking, and examines the impact of Russian business in Russia's dealings with Western and Eastern Europe, the Caspian, the Caucasus and the Far East. Andreas Wenger is professor of international security policy and director of the Center for Security Studies at ETH Zurich (Swiss Federal Institute of Technology). His main research interests are in security and strategic studies and the history of international relations. Jeronim Perovic is a senior researcher at the Center for Security Studies at ETH Zurich. He works on contemporary aspects of Russian foreign and security policy, energy politics in the Caspian, regionalism in Russia, and Soviet-Yugoslav relations. Robert W. Orttung is associate research professor at the Transnational Crime and Corruption Center of American University and a visiting scholar at the Center for Security Studies at ETH Zurich. His interests are Russian regional politics, business-state relations, corruption, organised crime and terrorism.